We all know that Filipinos are hardworking, productive, and with good English skills and technical skills. 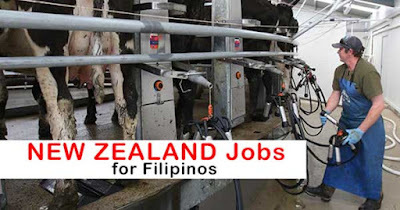 This year, New Zealand offers thousands of jobs for Filipinos, especially for skilled workers. The application process is not easy which can take up to 3 months, but it's worth it when you landed a job because there's a high salary waiting for you and NO PLACEMENT FEE. In addition, applicants must have at least 3 years working experience. According to ABS-CBN, the salary is over P100,000 and can apply to bring the whole family after one year working there. If you would like to work in New Zealand, we have listed POEA accredited agencies that can be applied. CENTURY PROMOTIONS & MANPOWER SERVICES, INC.
General Reminder: Apply directly to these agencies and don't leave your personal details in the comment section. Note: This blog is not connected to these agencies or in POEA, all of the information above is gathered and verified in POEA website. If you want to check this jobs, we have a tutorial on how to check a POEA job. 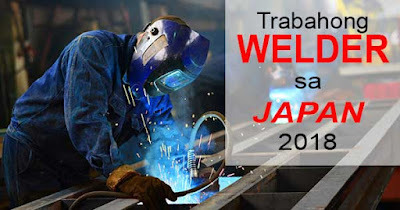 As of now, the country of Japan is currently in need of welders to do the skilled work. As we all know, Japan is one of the most modernized countries in the world. Different and big infrastructure, buildings are everywhere so definitely they will be needing strong manpower on the field. Well, if you are one of the welders who want to work in Japan this 2018, don’t worry because this article might be for you. Applicants must undergo a training and learn Japanese or Nihonggo Language, the good news about applying in Japan is no placement fee to be collected. If you are interested in this job and feel that you are qualified enough, continue to read the following information below for you to be guided. 22 - WELDER - EVERLAST INTERNATIONAL PLACEMENTS INC.
16 - WELDER - MULTI-ORIENT MANPOWER & MANAGEMENT SERVICES INC.
6 - WELDER - HRD EMPLOYMENT CONSULTANT AND MULTI-SERVICES, INC.
3 - WELDING - MULTI-ORIENT MANPOWER & MANAGEMENT SERVICES INC.